Federal budget documents often show the same spending in two different measures, “budget authority” and “outlays.” As an editor, reporter or infographics journalist, you need to know the difference between the two, or you will waste copious time figuring out which figures to use and why your numbers don’t match everyone else’s. Fortunately, the budget states clearly on every table and spreadsheet whether the numbers are calculated as budget authority or outlays. So what’s the difference between the outlays and budget authority? Outlays for fiscal 2013 reflect the actual amount of money the federal government will spend in 2013. The outlays figure for 2013 includes some unspent money that was authorized in previous budgets and excludes some spending approved in 2013 that will carry over into 2014 and beyond. Budget authority for 2013 excludes any funding authorized in previous years but includes money authorized in 2013 that will carry over into the future. 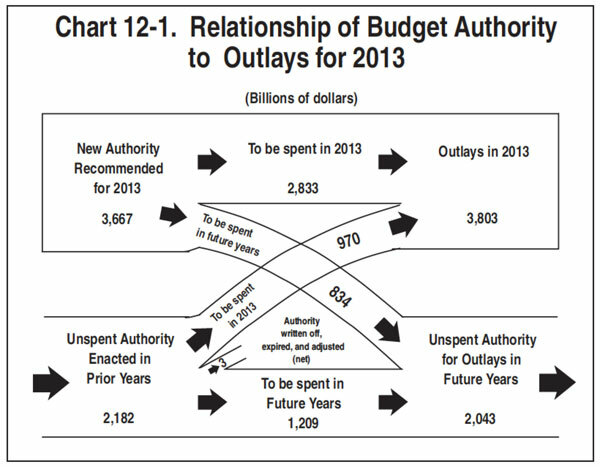 If you are having a hard time keeping that straight, check out the diagram above, which comes from the budget concepts section of the federal budget, page 138. So when do you use outlays and when do you use budget authority? Use outlays when you are referring to the overall size of the fiscal budget for a given year or when you want to show the deficit or surplus. Use budget authority when you want to show the effect that the administration’s policy decisions that year had on various agencies or functions of the federal government. Because it doesn’t count money approved in previous years, budget authority gives you a clearer picture of whether an administration is cutting or increasing funding for a department. The two examples above come from the summary tables section of the budget, where you will find most of the top-line budget figures. You are currently reading Budget authority vs. outlays at Seth's Sources.